If you didn’t see the Players Championship last week, we believe that we can sum up the majority of the action for you in three storylines. 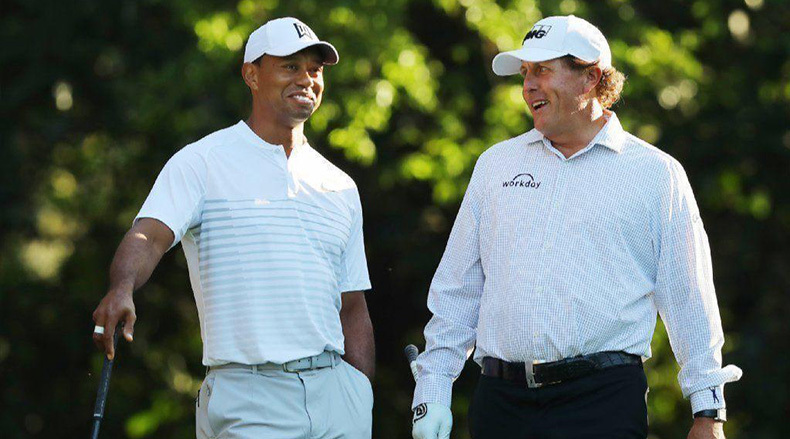 Firstly, there was Phil Mickelson’s questionable attire choice on Thursday afternoon. Lefty opted out of his traditional look and sported this bizarre button down white shirt. As you can imagine, Mickelson was ridiculed mercilessly on Twitter. Tiger Woods did not get off to the start he was hoping for at the Players with rounds of 72 and 71 on Thursday and Friday. But he made the cut by a single stroke, and rebounded brilliantly on Saturday morning with the best 9-hole performance of his career at TPC Sawgrass. Woods birdied four of his first five holes and poured in two more on 7 and 9 to make the turn in 30 total strokes. And he kept his momentum going on the back nine with birdies on 11 and 12 en route to a 7-under 65, catapulting himself into a tie for ninth place at the end of play on Saturday. Unfortunately for Tiger, Webb Simpson was sizzling hot all week long at the Players Championship and could not be caught by anyone in the field. The 2012 U.S. Open winner opened his week with an impressive 6-under 66 on Thursday and then took his game to another level on Friday, tying the course record with a 9-under 63. Simpson made an eagle, three birdies, and five pars on the front nine to make the turn in 31 strokes, and then exploded on the back nine with a string of six straight birdies on the back, beginning on the 11th hole. In fact, Simpson was on pace to shoot a 59 as he made his way to the 17th green. And he probably would have done it had it not been for that pesky island green. To the lowest of lows. Simpson continued to dominate and make ridiculous shots on Saturday and by the end of play on Moving Day, Simpson was seven shots clear of the field. That massive lead allowed him to cruise to his first Players Championship title on Sunday afternoon. During his practice round on Wednesday, Justin Thomas surprised a 12-year-old fan named Christian, who was in the gallery on the 17th hole, with an opportunity to hit the island green in front of a large crowd. Using Thomas’s club and glove — both of which were considerably too big for him — Christian hit a good shot and only missed the green by a small margin. Prior to the Players Championship, brothers Wesley and George Bryan attempted a couple of impressive trick shots on TPC Sawgrass' iconic 17th hole. First, Wesley showed off remarkable hand-eye coordination as he struck a ball out of midair and onto the island green, before burying the putt for a birdie. George followed next, and one-upped his brother by making a birdie from the site of Golf Channel’s future Morning Drive studio, roughly 50 yards behind the tee box. Webb Simpson was not the only one who tied a course record at TPC Sawgrass last week. Reigning U.S. Open champion Brooks Koepka shot a 63 on Sunday, highlighted by this remarkable albatross from 208 yards on the 16th hole.